There’s an appeal in fine jewelry that’s not from a boyfriend – a visible manifestation of an independent spirit. So it’s a strong-willed woman that wears designer Selin Kent’s jewelry – relishing of a ring that’s the fine-jewelry antithesis of a sugary engagement band, this is a woman who can take care of herself. 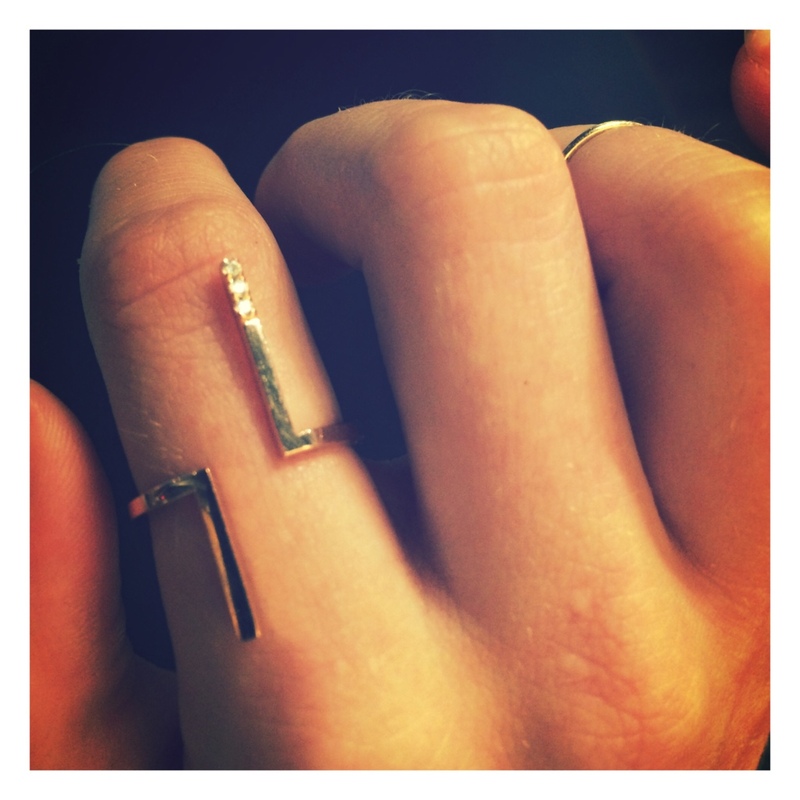 And so begins my fixation with Selin’s gold-and-diamond finger baubles. It takes a powerful je-ne-sais-quoi to make a girl fall hook, line and sinker for designs so spare, but the psychology eludes me. I came across the Nico ring – a vertical bar of white diamonds set against a double band of black gold – right before Christmas last year. I don’t remember whether I saw it first in the editorial photographs on Goldyn’s website and then chased it down in the store, or the other way around. I just recall precariously lifting the bell jar under which the ring resided and then snatching it to slide onto my right hand, a move that brings to mind Emily’s vivid accusation to Andy Sachs in The Devil Wears Prada: “You sold your soul to the devil when you put on your first pair of Jimmy Choos, I saw it.” I’m sure there was an obvious lustful gleam in my eyes. But heartbreakingly, albeit luckily for my limited bank account, the ring was too big, slipping off even my middle fingers. I perched it back under its heavy glass shelter, with a promise to the ring I’d be back for it. Knowing me, I probably said that last part out loud. A move to New York City and six months buried the fit of desire for the Nico ring in the back of my memory. But then in July I visited Selin’s NoHo apartment for this story, and our chat brought back the longing nearly full-force. I half-heartedly told myself I would hold out; wait for a new job as a reason to pass off the splurge as a reward. But by now I know better than to believe my own weak vows about swearing off. So during a recent trip home to Denver, I stopped by Goldyn to say hello and try on the Nico ring again; a dangerous endeavor, with the temptations I know lie within the boutique’s walls. For one more day, I forced myself to leave the store empty-fingered, but by then the indulgence was no longer a question of if but when. The siren song of Selin’s collection was too strong. I would return within the week; my jewelry collection was gasping for air and disposable costume jewelry was not the resuscitation it needed. In those few days during which I steeled myself to hand over my credit card, Selin’s rose gold Koko ring imprinted itself in my mind – decidedly less edgy than than the Nico’s black gold, but in a way even more architectural with its clean use of negative space. I’ll admit that a price tag half that of the Nico had something to do with it, but the Koko ring’s quiet but impactful statement made it my perfect “starter” piece. Paired with a gold mid-finger band, it stands out as a wearable piece of Instagram-worthy modern art. It has me reaching for things with an oh-so-casual sweep of my right hand and planning outfits around it. I’m not even a little bit sorry for the splurge. The Koko ring is the first satiation of my hunger. I sense the Nico ring, in all its black glory, is next; they say you never totally get over your first love. To quote Stella Tennant, I fear the obsession is with me forever. Selin’s two big influences, music and architecture, have me curious why she chose jewelry design. The craft was not the field she started in, and Selin’s path in the newfound trade evolved organically. “I fell into it in a really random way. My first job out of college was at a market research firm in New York – a high-powered, corporate job. And I sort of had a reaction against sitting in front of a computer all day, and I wanted to learn how to make something with my hands. Click here to shop Goldyn’s selection of Selin Kent jewelry (including earrings and necklaces), and see Selin’s full collection here.